Washington, DC: US President George W. Bush signed legislation late on Wednesday night that reverses three decades of US policy and allows American businesses to enter India’s multibillion-dollar nuclear market. The US agreement on civil nuclear cooperation permits American businesses to sell nuclear fuel, technology and reactors to India in exchange for safeguards and UN inspections at India’s civilian nuclear plants. “By undertaking new cooperation on civil nuclear energy, India will be able to count on a reliable fuel supply for its civilian reactors, meet the energy demands of its people, and reduce its independence on fossil fuels," Bush said at a ceremony in the White House. “For our part, the United States will gain access to a growing market for civilian nuclear technologies and materials that will help American businesses create more jobs for our people here at home." 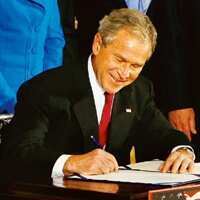 The signing of legislation, which approves US-Indian civilian nuclear cooperation, is the result of three years of work by Indian officials and the Bush administration. The President said the measure would build on the growing ties between the world’s two largest democracies. “This agreement sends a signal to the world: Nations that follow the path to democracy and responsible behaviour will find a friend in the United States of America," Bush said. Secretary of state Condoleezza Rice and India’s foreign minister, Pranab Mukherjee, are expected to sign the overall bilateral nuclear cooperation accord on Friday.